Our galactic center, around which everything in our Milky Way rotates, is a supermassive black hole. Around it is a huge stellar density. It is hidden behind large clouds of dust. Nevertheless a strong radio and X-ray radiation from there reaches us. 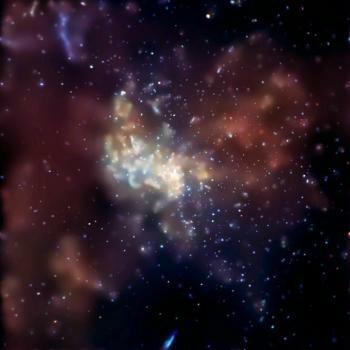 Sagittarius A* is surrounded by many other black holes and neutron stars of which every million years or so one is swallowed. And it is orbited excentrically by at least 20 stars, amongst it the blue star S2. This star has a distance between 5.5 light-days and only 17 light-hours (90 AU). This isn't dangerous for the star yet, but it gets closer and closer. Some time in the future, when its distance is 16 light-minutes, S2 will get disrupted and swallowed. X-ray view to the center of out galaxy with its many Black Holes.